Washington state is working to narrow the opportunity gap by ensuring that all young people - especially those furthest from resources - have access to quality expanded learning opportunities. We all know that education continues beyond the school day, so all our state's young people should have access to these resources - after school, in the summer and throughout the year. High-quality expanded learning opportunities complement classroom instruction and parents' efforts with programs that build lifelong skills, improve academic performance, and inspire young people to discover their individual passions. The Raikes Foundation is working to help build a system that ensures high quality expanded learning opportunities for Washington's youth. Expanded learning program staff help build stronger connections between families and schools, adding a network of caring adults who are aware of young people's daily lives and the challenges they may be facing. High quality programs also help young people develop social-emotional skills and build trusting relationships. Grounded in the strengths and needs of communities, expanded learning programs are particularly powerful for historically underserved populations. If we want to narrow the opportunity gap and help develop tomorrow's leaders, we must ensure all young people have equitable access to these programs. Washington state is poised to do this by building on investments in early learning and K-12 to create a statewide system that promotes access to quality expanded learning opportunities. What we've learned in talking to young people, communities and experts in the field is that at its heart, a high quality expanded learning program provides a sense of home and belonging that sets the stage for confidence, individuality and growth. Youth build strong, lasting relationships that encourage confidence, collaboration, work ethic, and individuality. With a foundation of trust, high-quality programs challenge young people to explore, lead, use their own voice and engage them in content that either connects with their schoolwork or explores subjects they are interested in. There are four key pillars that must be in place for an expanded learning program to be successful. Safe: Quality programs provide safe, healthy and developmentally appropriate learning environments for all participants. Supportive: Quality programs respect and are responsive to the diversity of program participants, their families, and community. Strong Interactions: Quality programs develop, nurture, and maintain positive relationships and interactions among staff and participants. Engagement: Quality programs promote a sense of purpose and individual empowerment in youth through opportunities to engage in a variety of experiences, participate in planning, and exercise choice of leadership. 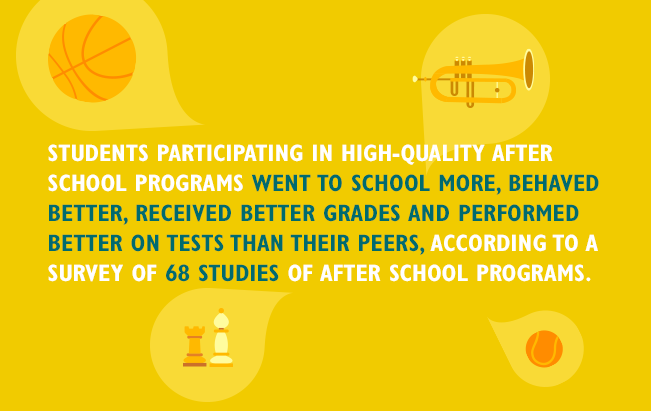 Research confirms that high-quality youth programs can make a positive difference in young people's academic achievement, social skills and risk reduction. Yet many programs do not meet the quality bar that leads to successful outcomes and need help to improve. We are delivering that help. We are working with program staff, policymakers, funders and young people to elevate the conversation about quality, and we are partnering to ensure organizations get the knowledge, tools and support they need to develop and maintain high quality programs. The Raikes Foundation has invested in strengthening the quality of expanded learning opportunities in Washington since 2009. With the help of our partners, we have worked to change the conversation about quality, foster alignment around what quality looks like and empowered youth organizations across our state with the skills and resources to improve quality. In 2016, the state of Washington, in partnership with Schools Out Washington and the Raikes Foundation, launched a pilot initiative working with fifty programs from four counties around the state to participate in a quality assessment and improvement process. The goal is to show that, with proper support, expanded learning programs can deliver the type of high-quality engagement proven to result in meaningful outcomes for young people. The pilot is working to create a streamlined system of support, including coaching and training for program staff on how to best engage young people. Hundreds of staff serving more than 75,000 young people have benefited from training, assessments and professional development designed to improve their interactions with young people, and infrastructure is in place to bring tools and techniques for improving quality to many more programs. For decades, expanded learning opportunities like summer learning and after school programs operated in isolation, without any common language or standards for quality. While many of the programs delivered great benefits to the participants, expanded learning wasn't a field the way traditional in-school education is - it didn't have professional development opportunities for its staff; there wasn't a common definition of what a program should look like; and there was little support for helping programs both improve and grow. That led to sporadic access to gaps in quality - particularly for low-income young people and youth of color. That's where the Sparkwind Movement comes in. Over the past several years, Schools Out Washington and the Raikes Foundation have worked with a variety of youth-serving organizations and public sector partners to put the field of afterschool, youth development, and summer learning on the map. Sparkwind brings that to life. As a part of the Sparkwind Movement, providers now have a central repository - a Youth Program Registry - which is a free tool and a comprehensive database to support expanded learning opportunities, youth development professionals, and quality information in Washington. This data will allow for an assessment of the service gaps in the sate, help target funding and support services, and engage advocates to make the case for additional resources. Over time, data from the Youth Program Registry will enable families to search for programs that meet their needs and will help programs better market their services. Good data will support this emerging field to gain insights, improve quality and support organizations, programs, staff and families. Providers who join the Sparkwind Movement and enter their data into the Youth Program Registry can enroll to receive quality assessment and dedicated coaching, set a customizable quality improvement plan, and track progress over time. But the Sparkwind Movement is more than a database. It also comprises a pilot project of fifty programs from four counties around the state who were chosen to participate in a quality improvement process. This pilot aims to show that with proper support, expanded learning programs can deliver the type of high-quality engagement proven to result in meaningful outcomes for young people. It will create a system of support including coaching and training for program staff to engage young people. The lessons learned in this pilot will help support the entire system. The Sparkwind Movement is also building bridges between state and local work focused on young people to bring cohesion and community voice. While the Sparkwind Movement brings all programs across the state together, local discussions and planning help to focus on the needs of individual communities and families. The movement is working with lawmakers in our state to bring the resources necessary to build a sustainable high quality system of expanded learning opportunities for all young people in our state. “Leadership is built into every program,” says Salls, before launching into the incredible number of steps Bike Works takes to empower young people and encourage them to take ownership of the programs and space. School's Out Washington has created the Washington State Quality Standards for Afterschool & Youth Development Programs. The standards support Washington state programs in achieving positive youth outcomes by providing staff with guidelines for what quality looks like in a program setting. In 2016, the Raikes Foundation commissioned a literature synthesis on the benefits of quality Expanded Learning Opportunities programs. The synthesis demonstrates that quality ELO programs that have an academic focus have a positive impact on youth outcomes. The synthesis also considers the main elements of quality programs as well as the relative cost of quality ELO programs in comparison to costs in quality pre-kindergarten programs. Drawing on research from several fields in addition to theory and practice to identify the building blocks for success in life, this report funded by the Wallace Foundation establishes a developmental framework to consider the skills that children and youth need for academic and social success. Academic skills are not the only thing a child needs to succeed in life and quality ELO programs often help build other social emotional skills that complement the school day. To lead statewide data collection and evaluation, as well to create professional development and higher education pathways and coaching framework for the Expanded Learning Opportunities Quality Initiative. To complete a two-part quality evaluation in Seattle Public Schools on their summer learning programs, Summer Staircase. To lead the Sparkwind Movement and quality movement with programs and communities, as well as coaching and training efforts, statewide advocacy and regional learning communities for ELO programs. To broaden reach on the impact of high quality with ELO with new constituents such as business leaders and law enforcement through partners at ReadyNation and Fight Crime, Invest in Kids. To lead the King County ELO local coalition which brings together ELO programs, funders, advocates, and other partners together to provide feedback on the statewide quality system and connect local priorities. YDEKC also serves as the link to national systems building technical assistance through Every Hour Counts for other regional ELO coalitions. To support a complementary study to the ELO Quality Initiative in 21st Century Community Learning Centers that focuses on youth perception on beliefs, motivations and mindsets in quality ELO programs.